Some people like to walk, while others like to run. Whatever your preference, the Dallas YMCA Turkey Trot is an event the whole family can enjoy together. 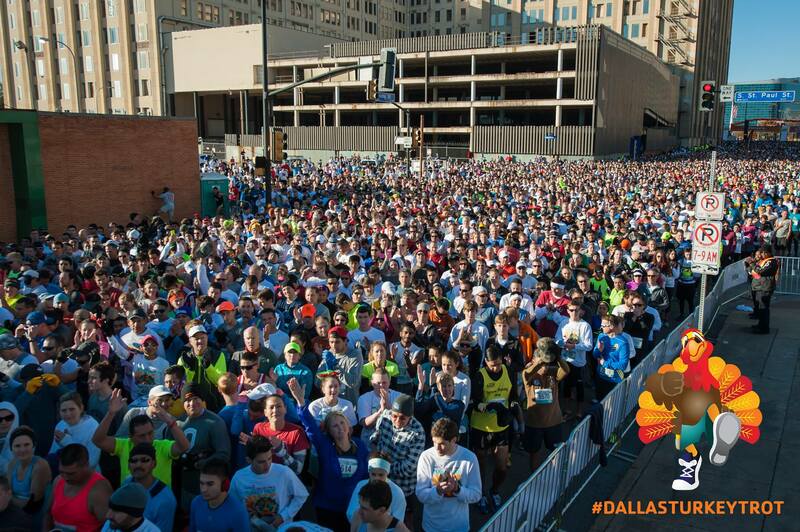 It’s one of the largest multi-event races in the country and is being held in downtown Dallas on Thanksgiving Day. Well over 28,000 people turned out for last year’s event. More are expected this year. If you and your family are participating, volunteering, or enjoying the festivities as a spectator, avoid the hassle of getting around road closures and finding a parking space by taking DART. The Turkey Trot is stroller friendly, and so is DART. The center car of every DART Rail vehicle is a low-floor section that offers level boarding with the rail platform. DART’s new fleet of buses also has low-floor sections and is equipped with ramps that deploy for level boarding from the curb. DART buses and light rail trains will operate on a Sunday schedule Thursday, Nov. 26. The Trinity Railway Express will not operate on Thanksgiving Day. Some bus routes will be placed on detour for the race. Those routes include: 1, 2, 11, 12, 19, 21, 26, 29, 35, 42, 49, 52, 59, 60, 76, 110, 111, 161 and 164. Visit dart.org to learn more about DART’s special service throughout the Thanksgiving holiday weekend.